Meow! Cats is back in Chicago. But not like you’ve seen it before. A little over a year ago, the non-Equity national tour stopped in town at the Cadillac Palace for a handful of performances. Despite the inflatable sets, canned tap-dancing and sluggish tempos, the show still delivered the magic. But that’s probably due more to my nostalgia with the piece than anything — it was my first major musical. Twenty-two years ago my parents took us to see the hit West End transport at the Winter Garden Theatre on Broadway, and I was transported up the heavyside layer with Griz. So, this early ’80s musical has always held a special place in my heart. When I heard Theo Ubique was staging this legwarmer revue, I was intrigued. While Theo Ubique is known for producing big musicals in their 55-seat café/cabaret space, and doing them very well, they’ve never really done such a dance-heavy piece before. I mean, you can only expect so many high kicks on a stage roughly the size of my bathroom. Overall, director/choreographer Brenda Didier does a mighty fine job reworking Gillian Lynne’s athletic original staging for a confined space. 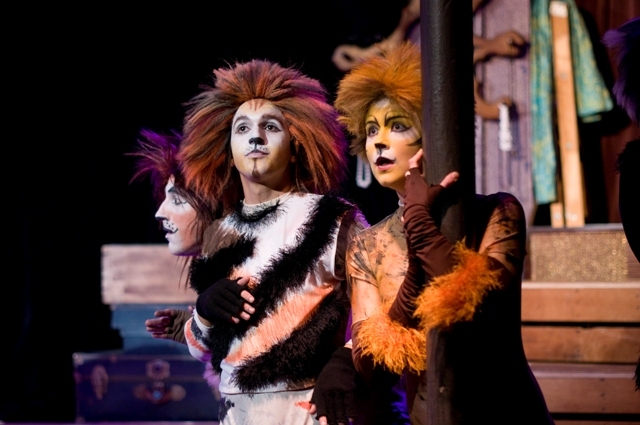 (Yes, Trevor Nunn directed the original show, but I really think Ms. Lynne deserves most of the credit for the unique style of Cats). And the intimacy of the No Exit Café benefits this piece: more than once you’ll have a cat emoting literally inches from your face. You are part of the junkyard. Some numbers, however, suffer from the stripped down staging — poor Mister Mistofoffelees isn’t very magical here, aside from a fancy sparkle coat, and the danger of McCavity is completely eliminated. Though they sing the song about him (quite well, I might add), that’s all you see of the mystery cat. Also, in a completely new addition to this production, Didier unsuccessfully introduces a human female narrator of sorts (though she doesn’t speak). The staging suggests in the overture that she’s discovered T.S. Elliot’s poetry, and the cats have sprung to life before her eyes. But then she turns into Cassandra, one of the cats, at the end of act one. Huh? This addition is distracting, confusing and so unnecessary. Aside from that, this is a really fine, small-scale production that helps you focus on T.S. Elliot’s fanciful wordplay. In fact, my mom said she enjoyed this production much more than when we saw it on Broadway. Much credit for delight of this experience should go to the very hardworking cast of 13. While each actor does a commendable job and seems to be having a (jellicle) ball, I must call out Maggie Portman, who plays Rumpleteezer in act one and Demeter in act two. This two-time Jeff Award winner proves that she’s not only a remarkable leading lady (from her starring turns in Chess and Evita — both at Theo Ubique), but a fantastic ensemble member. She’s giving one of the most consistently engaged performances of the lot — always focused, always amused. And when Sydney Charles as Grizabella belts her way through the seminal favorite, “Memory,” you can’t help but hum along. The tune may be more than overexposed, but it remains a winner. While the heavyside layer in Theo Ubique’s production may be somewhere by No Exit Café’s bathrooms, the piece still transports. Music direction by Ethan Deppe is also quite solid. A band of five does great service to Sir. Lloyd Webber’s disco-infused score. I loved all the cats crawling around my feet and rubbing me and singing and purring in my face. It was such an intimate experience I just wanted to pet them as I LOVE cats and have 3 at home.. Cats are so comforting and this show was comforting and joyous. LOL I loved reading this, your references to your bathroom and bathrooms overall cracked me up. My question is, how do these companies manage to cover costs? Booking the space, the costumes (which actually look pretty good), the cast, the sets, the band..? In a space that seats 50 people? Hey, Ali! I’m not that familiar with the business side of putting on a show, but I’d imagine the actors work for nothing, and most of the money is spent on securing rights to the show and renting some of the costumes and wigs (I bet they make most of them themselves). The band probably gets some money, but not much. And Theo Ubique has been a fixture at No Exit cafe for several years, with a strong audience base and some solid donations. not to mention that I don’t think that there is even one compnay in chicago that is funded entirely off ticket sales, or even mostly! grants and donations play a huge role in the chicago theatre community. I can tell you from personal knowledge that the actors do get paid at Theo Ubique, as do the musicians. And the rates, at least for musicians, are comparable to the best paying black-box theaters in the city.